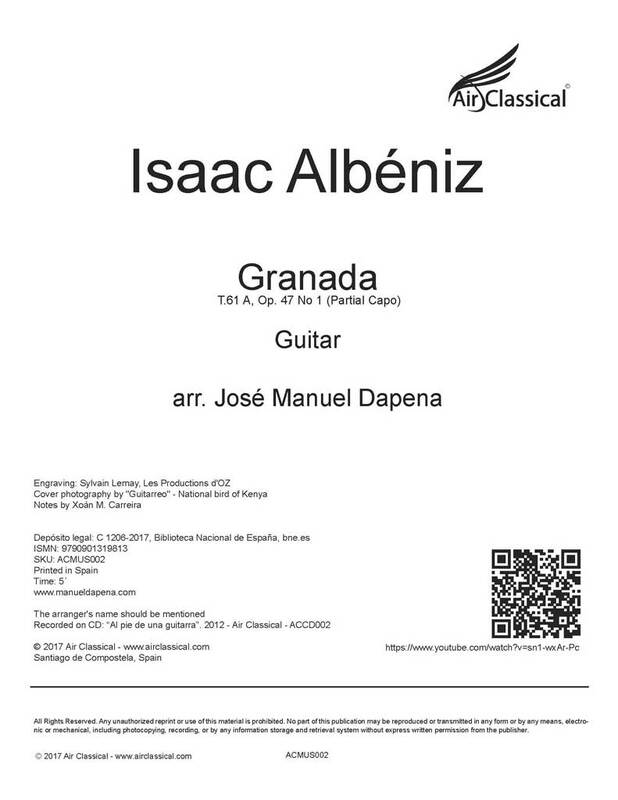 Granada by Albéniz. Partical capo arrangement. 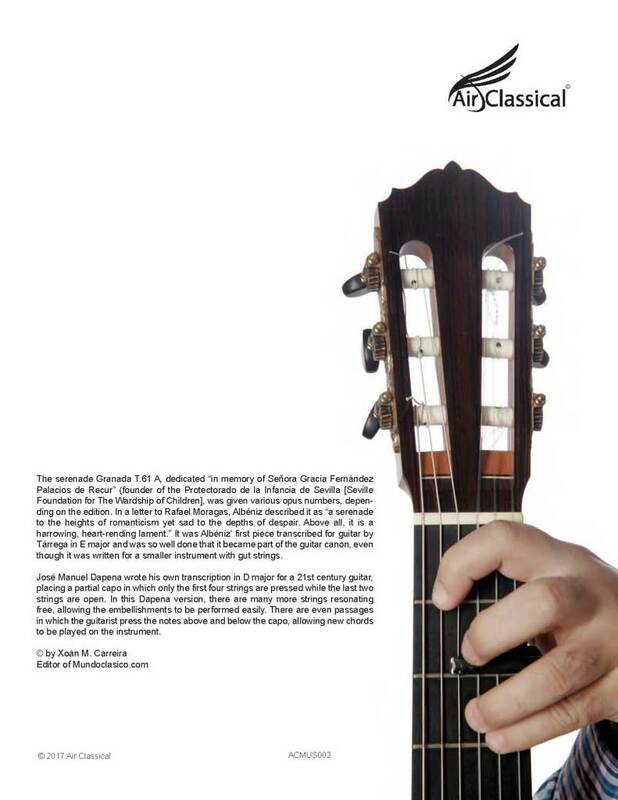 The serenade Granada T.61 A, dedicated “in memory of Señora Gracia Fernández Palacios de Recur” (founder of the Protectorado de la Infancia de Sevilla [Seville Foundation for The Wardship of Children], was given various opus numbers, depending on the edition. In a letter to Rafael Moragas, Albéniz described it as “a serenade to the heights of romanticism yet sad to the depths of despair. 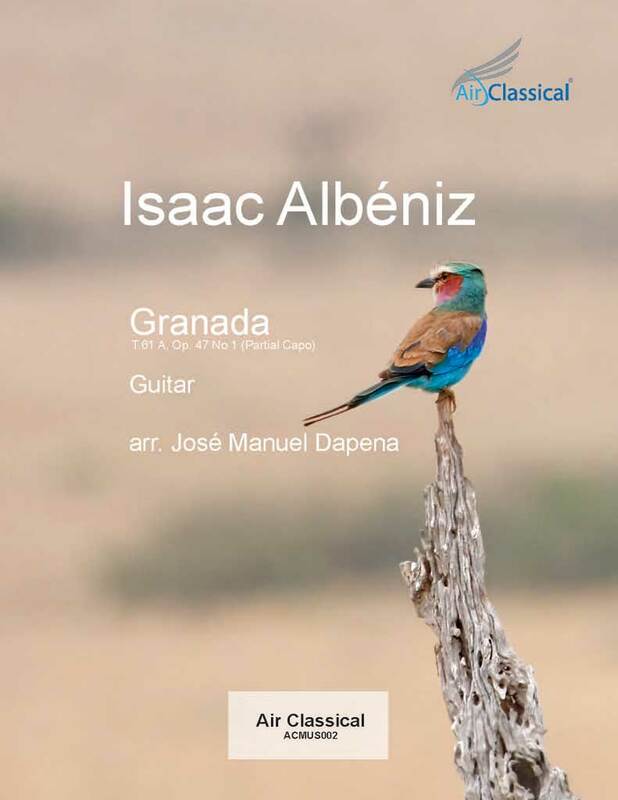 Above all, it is a harrowing, heart-rending lament.” It was Albéniz’ first piece transcribed for guitar by Tárrega in E major and was so well done that it became part of the guitar canon, even though it was written for a smaller instrument with gut strings. 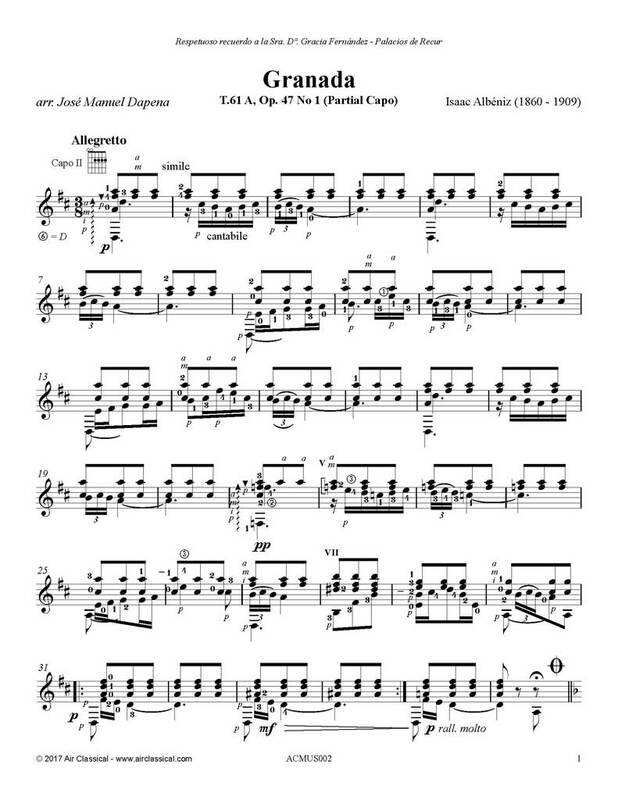 José Manuel Dapena wrote his own transcription in D major for a 21st century guitar, placing a partial capo in which only the first four strings are pressed while the last two strings are open. In this Dapena version, there are many more strings resonating free, allowing the embellishments to be performed easily. There are even passages in which the guitarist press the notes above and below the capo, allowing new chords to be played on the instrument. La serenata Granada T.61 A, dedicada con “respetuoso recuerdo a la Sra. Dña. Gracia Fernández Palacios de Recur [fundadora del Protectorado de la Infancia de Sevilla],” recibió varios números de opus, según las diversas ediciones. En una carta a Rafael Moragas Albéniz la describe como “una serenata romántica hasta el paroxismo y triste hasta el desespero. 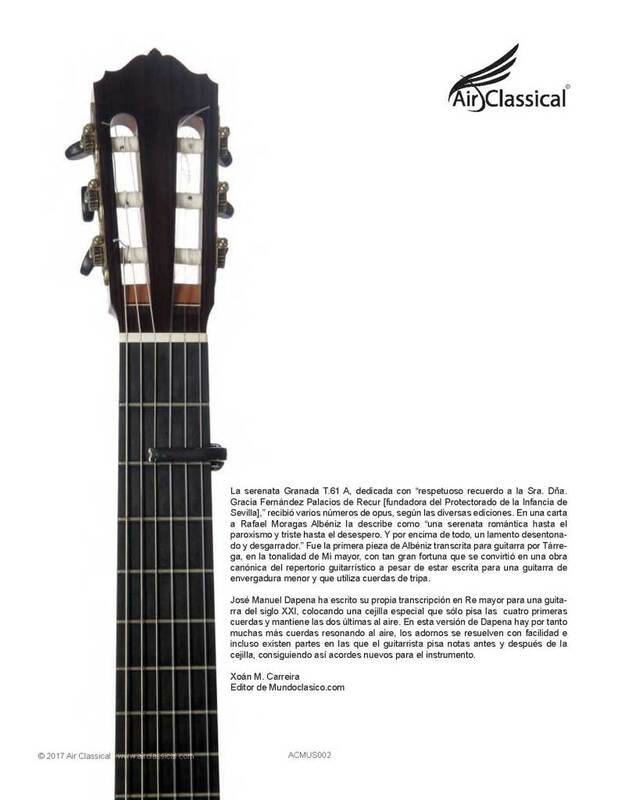 Y por encima de todo, un lamento desentonado y desgarrador.” Fue la primera pieza de Albéniz transcrita para guitarra por Tárrega, en la tonalidad de Mi mayor, con tan gran fortuna que se convirtió en una obra canónica del repertorio guitarrístico a pesar de estar escrita para una guitarra de envergadura menor y que utiliza cuerdas de tripa.